Last year Acucraft Fireplace Advisor Mark Kennedy received a call from Bill who was in the process of building his new modern home in La Crescent, MN. Bill shared his unique fireplace idea with Mark. He envisioned an indoor gas, open-flame fire pit with a 22″ open viewing area between the flames and four-sided suspended glass. Bill wanted to avoid unsightly supports, so Acucraft designed the tempered glass to be anchored by the hood from the ceiling. Certainly, Bill had chosen the right manufacturer to bring his fireplace dream to life. For over 39 years, Acucraft has been specializing in designing and manufacturing one-of-a-kind custom fireplaces. And an indoor fire pit like this would add the perfect touch to create a unique atmosphere for Bill’s future sunken living room. Next, Bill, the home owner, engaged his Architect, Chris Bach, of award-winning CityDeskStudio—known for modern contextual architecture and design. Together with the Acucraft Design Team, they collaborated on this fireplace idea. The Acucraft Team designed the indoor fire pit to accommodate their budget, work within the space limitations, meet performance and safety compliance, and maintain the aesthetics of Bill’s fireplace vision. Then the Acucraft Design Team produced 3-D drawings that concealed valves, pipes, and venting for a clean, modern appearance. Upon design approval, the Acucraft Production Team got to work. Acucraft’s highly skilled Fabricators, Welders, and Finishers handcrafted Bill’s custom gas open-flame fire pit using the highest quality materials and components. This way, Bill can enjoy his indoor fire pit for a lifetime. Before the indoor fire pit was crated, shipped and delivered to the job site, Bill’s fireplace was Third-Party tested and certified within Acucraft’s internal test lab to meet or exceed ANSI Z21.50/CSA 2.22 performance and safety standards. Acucraft is one of the few, if not the only, fireplace manufacturers in the world who is third-party certified by Lab-Test Certifiecation, Inc. to conduct internal testing. That’s how much Acucraft cares about your fireplace safety and performance for a lifetime of happy burning. From idea to done, Acucraft made Bill’s custom indoor open-flame fire pit dreams come true! Acucraft provides our customers with a world-class experience to exceed their expectations. We deliver innovative solutions, revolutionary designs, use the highest quality materials and components, rigorously test units for safety and performance, and meet lightning-fast response times. Every unique fireplaces is backed by the Acucraft Lifetime Guarantee. Now that’s peace of mind for a lifetime of fireplace enjoyment. The indoor gas fire pit with open flame accents and warms the sunken living room area. For 39 years, Acucraft has been designing and manufacturing one-of-a-kind wood-burning and gas fireplace systems. 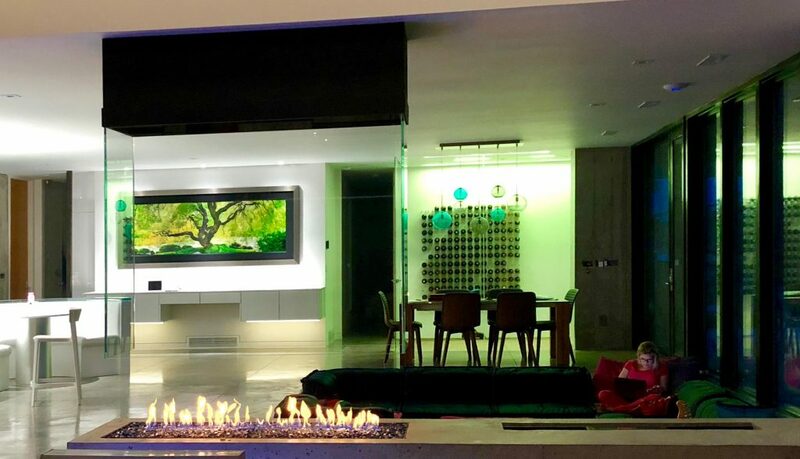 Whether you’re looking for a wood-burning home-heating solution, an outdoor fire pit, or a modern see-through gas fireplace, Acucraft has a fireplace to fit seamlessly within any residential or commercial space. Start your fireplace dream today, call Acucraft toll free at (888) 317-6499, email info@acucraft.com or visit www.acucraft.com.